There's something to be said about using an isolated asylum for the criminally insane as a locale in a crime fiction novel -- in fact, the setting is one of the reasons I bought this book. I know that sounds really bad, but I can't help it. I think it comes from reading all of those HP Lovecraft stories where the narrator is stuck in an asylum because he has encountered something that made his mind snap, and no one believes him. There's nothing like that here, but in this book, the asylum set in the French Pyrenees does house some pretty bad people. The Frozen Dead is definitely not a cozy read; it's more of a police procedural where the cops are faced with some pretty grisly crimes. 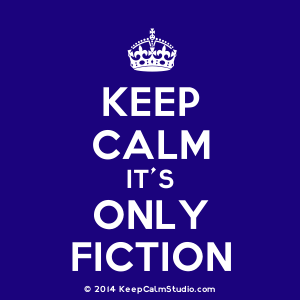 Some of the storyline seemed a little out there at times, but more on that later. Overall, though, it definitely held my interest and the nearly 500 pages flew by because I got so caught up in it all. 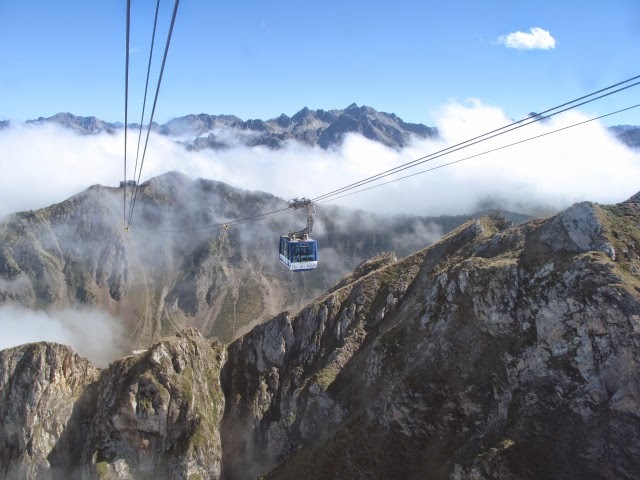 On their way to a four-week stint at a hydroelectric power station, maintenance workers taking the cable car up the mountain near Saint-Martin de Comminges see what looks like a large bird hanging "above the platform, just below the cables and pulleys, as if suspended in the air." As it turns out though, this is no bird, but rather a horse. Commandant Martin Servaz from Toulouse is summoned to the scene, not knowing that the murder victim is a horse. He realizes that he's there because the animal is a prize thoroughbred owned by Éric Lombard, a wealthy man from "a financial dynasty, captains of industry, entrepreneurs who had reigned over this patch of the Pyrenees, over the département, and even over the region, for six decades or more." Servaz is none too happy -- at home he's busy working on the case of a homeless man who was beaten to death by three teens. The scene of the crime is not far from the Wargnier Institute, an asylum for the criminally insane whose residents are there because no other institution will house them, and the crime scene unit finds DNA belonging to a legendary murderer who is now a resident there. But according to the powers that be at Wargnier, there is no possible way the man could have escaped and returned -- the Institute is well secured. It isn't long, however, until a man is found hanging from a bridge. The investigation into who is behind it all turns into a race to both find the killer and prevent yet another murder. While the author delves into the mystery, he also adds in another storyline in which a psychologist named Diane Berg arrives to start her work at the Institute -- and finds out that there is indeed something very odd going on behind the walls and the closed doors. There are really three mysteries at the heart of this story. First, of course, is the mystery of who is behind all of the murders; second (related to the first) is the connection that links all of these deaths together, and third is the puzzler behind what's going on at the Institute. As a whole, the book is well crafted and suspenseful enough to keep the reader turning pages, with an added bonus of a number of plausible suspects to keep the reader guessing. I thought I had it figured out twice and was way off the mark both times. For me, that's the sign of a good crime writer -- if I can't guess the who or the why, well, I'm happy that the author didn't make things so easy, appealing to the armchair detective in me. This is also a very atmospheric book -- and not just because of the inclusion of an asylum for the criminally insane. The author is very good at ratcheting tension, always maintaining an aura of suspense throughout. Plus, the story goes back in time to revisit the sins of the past and how they've come to haunt the present. Another appealing and well-crafted aspect of this novel is the author's evocation of place -- not only the physical locale (which made me want to bundle up and visit there in the winter) but also in terms of the social ills of the times: senseless violence as an outlet for the younger generation, the state of mental health treatment, corporate greed, power and influence, and much more. Turning to the niggles: the biggest one is that while I was okay (and surprised) with who the culprit turned out to be, the ending was off somehow -- it was like the author put in so much time and detail into the overall investigation and then well, there's the end of the book. Very quick, very short, and not enough explanation to make it completely satisfying. There's also the time spent in this book on Servaz's relationship with his daughter and his past -- this is a personal preference, and I realize that authors want their main characters to come off as real as possible, but there are ways to accomplish this without clogging the main flow of the crime story. Other people don't mind this aspect of crime novels so much -- but to me, it just gets in the way of what's going on in the investigation. It also adds a lot of a) distraction and b) unnecessary page count. 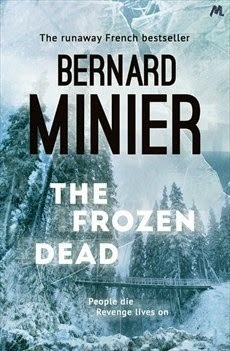 I have to say that even with the niggles I really liked The Frozen Dead, and I'll be eagerly awaiting the release of other books from this author. This isn't a book for the fainthearted cozy reader, and it's much better than many police procedurals I've read in the past. It's a clever mix of mystery and suspense that will keep the reader guessing right up until the very end. Definitely recommended for fans of translated crime fiction and those readers who want something with much more edge than the average police procedural. Nancy - I know what you mean about an asylum like this being an interesting setting for a crime novel. And it sounds as though there's a lot more here than a gore-fest. I'm glad you enjoyed it and I can see why you're interested in more from Minier. Definitely no gore fest-- really a good mystery novel! Watching it on French television at the moment - excellent adaptation of the original.